We are so excited to introduce the Toilet Sensor, a recent advancement in the home healthcare and post-acute care monitoring market. The Toilet Sensor can be paired with an alarm system to detect when someone stands in front of or sits on the toilet. Paired with an appropr iate monitoring system, this allows a caregiver to monitor frequency of use as well as duration of each use. With an accurate picture of a patients’ routines, they will have the possibility of catching the onset of certain Urological issues before they manifest into large debilitating problems. There are a few different types of sensors commercially available for measuring bathroom use, such as a toilet flush sensor that is installed in the tank of the toilet. However, the sensor was developed to address three different issues we saw with these sensors: determining duration of use, detecting when a toilet is used without flushing, and the emergence of tank less toilets. 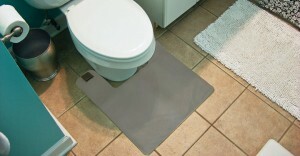 The Telehealth Toilet Sensor is a mat that is placed around the neck of the toilet and detects the presence of someone on or in front of the toilet. It is constructed from a durable water resistant polyvinyl top layer and a water resistant, PVC coated non-slip bottom layer. Both our sensor and the typical flush sensor detect the frequency of use, but only our sensor can also detect the duration of a toilet use. This additional information can give a caregiver a better idea of a person’s routine as well as any deviation away from this routine. While flushing the toilet after every use is a habit by many people, it is also common to see and hear of situations in which a person may not flush. Some reasons may include water conservation or simply not wanting to disturb someone who is in the next room. Whatever the reason, sensors placed in the tank become less effective because they may miss some bathroom uses when the toilet is not flushed. Without a log of every bathroom use, you get an incomplete picture of a person’s daily activities and well-being. Thirdly, with new construction of nursing homes and assisted living facilities, not all installed toilets have tanks that sensors can be installed in. These toilets rely on the water pressure of the building to provide the force necessary to flush the toilet. These toilets are commonly seen in public restrooms as well as commercial restrooms. Our Toilet Sensor can be used with any toilet or urinal, regardless of its flushing mechanism. Finally, bathroom privacy is an issue that most, if not all, people are concerned with. Cameras and even motion sensors are frequently unwelcome in the bathroom due to privacy concerns. Therefore, we have worked hard to make the Toilet Sensor be a non-invasive sensor that still delivers useful and important data to caregivers who are concerned about the health and well-being of a patient or loved one. Contact us today to learn more about our products, including the Toilet Sensor. This entry was posted in Aging in place, Resources, Technology. Bookmark the permalink. "Telehealth Sensors has provided us with technical innovation, manufacturing excellence, and the highest level of customer service. They provide high-quality, reliable products and partner with their clients to provide the best products available in the industry."